Krakout on the C64, Art by Terry Lloyd.. Awesomeness! Terry Peter Lloyd is a great friend of Mine. We have been separated now for a good deal of time since he went back to England and i remained here in the states. I worked with Terry for a number of years on a variety of games but i just want to mention a few of those games here today. The old Commodore 64 games that i did were nearly always worked on by Terry. He was the main artist and had a really intuitive and controlled way with the strange graphic style that was on the C64. I used to love working through them, nad he did some of my favourite ever graphics for one of my games. The game was Car-Vup, but that was for Atarti and Amiga and i wasn't gonna mention them.. DOH! So onto C64 graphics, Why have i mentioned them? Well it has to do with my previous post. The one where i say i want my newest game to be very reminiscent of C64 shoot-em-up stylings. Now i can do the graphics, but it takes me a while tbh. This means i am spending less time on the playtesting and play balancing. The play balancing is soemthing that i think is ridiculously important, and something that is missing from most of the XBLIG games at present. However with the newer sales reports going out about improved sales penetration, i am sure we will get better developers being busy in XBLIG, though i think that has already happened to some extent. Dang, here i go waffling again. Onto Terry. He is awesome, and i think i may have to get him to look over my graphics after i have finished them, or maybe i should ask him if he is interested in doing them from scratch. Now i am working with Paul Hoffmeier from Tall waiter productions, so cannot just make this decision without chatting with him. But i can Blog about it haha! I really want 5th Moon to be a commodore 64 type of looking shooter. I know i will be bringing it into the 90's with more bullets etc and smoother higher resolution, but i still want the C64 vibe to it. So with that in mind, i have started on the graphic style, a simple bass relief style. Here is the ship now during it's second incarnation. YAY! i got to put up my second video on gametrailers.com It always excites me to put up a video of my stuff onto a site like that. Well i wanted to include a nice link to their site including a picture (their logo prolly), but i cannot find a good way to do that. An amazing difference in the length of those urls. So i used the tiny one for my twitter feed. I think i will use more of them too! 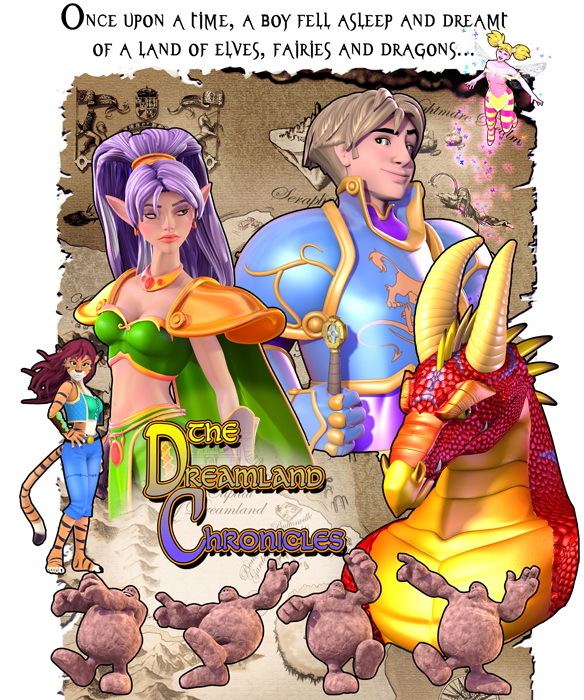 As i cannot link in a picture from Gametrailers.com, i supplied a picture from my web site, and it also happens to be the Dreamland Game box art. So it seems i have been a bit dumb. I have been writing all this text now for a number of months. I am so pleased with myself and the output i have had that i never really thought too much about anything but what i was writing. Well in an effort to get this Blog more noticed i decided to go looking for similar blog types to hang with. Hoping that they might become my followers as i am theirs. I did find a few good ones, though i do not know at this time quite how to link them in a way you folks can see them, bah! As it happens though, i noticed that the better blogs were the ones that posted at least a few times a week. Then i also realised that the Best blogs were the ones with pictures. WHAT!! No Way i hear you all gasp! Yes, it is true, it appears that pictures can also be posted. So now i realise i have been remiss and not posted a single picture in my blogs. And i have had a wealth of opportunity along the way. So now i plan to change all that. I will start simple and work my way into it, but i epxect to post at least One picture in my blog a week, if not more (more as i get faster at it). So what we see here is a massive drop in Downloads for each day. The press release has yet to Hit and any reviews. The is not much i can do about timing reviews etc, so that's out of my hands. The Press release is in my hands, but has been waiting for certain events here at home to move on a bit, also for it to be edited to some extent by friends. Now i can obviously wait no longer, so it will be sent for release tonight, whether it is truly ready or not. 1620 downloads. This is more of a drop off from the first day than i was hoping. 1. No longer a weekend day, and i would expect for activity over a weekend, probably including friday night. This interesting fact (if it was indeed fact) would make me have to make a decision about just what day i would release my game. 2. It is further down the new releases list. The further down the list on the Xbox it is, the less visibile it is. So the less people will see it to download it. Not nuch i can think of to do about this, besides having great boxart, which i think this game has, but it's never gonna be as good as it shrink away. 3. A lot of people would have seen the initial tweet about it's release and downloaded it. If this is how they learned of it then it was a one time deal. I do not have the kind of tweeter connections that Xbox or some people have to help this with my retweets of interesting info etc. I guess i need to never stop working on building my twitter connections. Does anyone agree with my sumations above ? I hope ths info is useful to others with their new releases. I have spent a fair bit of time today searching for like minded Blogs. Like minded because i really want to link with Blogs that discuss game development, pretty much in any way they want. I also want to link to as many XNA/XBLIG blog sites that i can. However i am having a real tough time finding them on Blogspot, and sometimes i find them using one of the other systems. This is a real pain, so i guess i will have to setup a links box and direcdtly link them in, which is more of a pain of course. here's hoping i find a lot more relevant Blogs to link with, adn hopefully they will link with me too. This is a new company a few of my very talented friends have created. They hope to do some character design and creation for advertisments and especially for TV adverts or in fact whatever needs a character. Good luck chaps, i really look forward to seeing your creations. Here is a link to their Sample video, it rocks! Check them out if you get chance. The games download and sales results have been published for me! I have been in this games creation industry for many a long year. I have seen machines come and go. But one thing that i have seen turn up (Sony started it!) is the TRCs and with the coming of the TRCs we have had to do some bending over backwards to get some games out. Now TRCs are not bad in themsleves. It is nice to have some semblnce of order and design. The TRC that states the screen cannot remain black for more than a few seconds at a time is excellent. There were many games in the past that had crashed, and you couldn't tell. Fice minutes later you would get bored of the loading and just switch to another game. Along with useful TRCs came the nitty gritty ones. The ones that were supposed to make the life of the gamer a little easier, and therefore the game a little nicer to the player. One such TRC is the Pulled Joystick Pause. When a joystick is pulled while in the middle of a game, the game should pause. Excellent idea, and i agree with the idea. But in practice this adds cost to the manfacture of the game. Suddenly the creation process has to make sure this rule is adhered too. I know most of you are thinking that this cannot be that bad. At times though it has been, with multiplayer games coming along this awkward testing got worse, and then we had inetrnet playing. Remote players could then inadvertantly pause your game when they accidentaly (yeah right!) pulled their joystick out. Just how many times in a persons life are they actually likely to pull out a controller. I know i have done it a few times, and i never cared if the game paused. What am i on, my latest high score. Well if i could do it once, i can do it again etc.So now the testing of a simple rule is rfaught with annoying edge cases. It is edge cases that really cause pain. The main rules themselves are still good to my mind (even if it sounds like i am completly trashing them!). So onto my final rant..
Pellmell just failed peer review. Why ? Well because of one of these edge cases. In this case it is the fact that you can actually crash my game by pulling the MU just as you select it. You have to be quick and get the timing right, but after a few tries it gets easier to time. WHO THE HELL DOES THIS? I mean, who removes their MU while selcting it? I know peer reviewers do, as they have made these nice guidelines to test peoples games with. I really hoped that XNA would test stuff for sure, but not have all the freakin silly edge case TRC testing that i face on my other jobs. I have no real reason to complain, everyone gets tarred with the same brush and testing patterns. Well they might do, haha. As i personally do not test edge cases i do not care about. Does that make me a bad tester? I dunno. I do test quite thoroughly the odd combination stuff that can happen with signed in profiles and joystick switching etc. Thos are things that a player would get very confused about. I do nnot believe they would get confused as to why the game crashed when performing MU pulling exercises. Now i have to catch the error. A stupid error in my opinion that MS should have taken care of by returnigng real test codes and not forcing me to Try..Catch surround my good code. BAH! Will i bother is the only real question now on my mind. Should i bother fixing this and uploading this improved version of the game to go live? After all the version that is already up there to be bought has this bug. Ok, my rant is over.. for now. I hope you all have better luck with these TRC edge cases. If you want to comment about some of the ones that frustrate you, please feel free. The idea that all those individuals around the world can ccreate more than a dedicated company is quite inetersting to me. The idea that if all those people that are currently connected by the Internet could get together and produce more original ideas and complete ideas is rather striking. Unlike BMW or IBM or any otehr think tank organisation, the people around the world are just not pulling as one resource. they are not pulling anywhere near in a single direction, so they must be pulling in a million alternative directions with their thoughts and ideas. What if we could get just a msall percentage of people to pull in the same direction, along the same lines etc. The power would be astounding. the possibilities amazing! Imagine a million people pulling towards a single goal, that would have to have the mere few thousand employees at IBM completely out matched. So how do we achieve it? Hmm, i haven't the answer to that yet, but maybe i could try to get all those people around the world to help answer it ..... DOH! Yes, it has passed. Thanks go out to all those lovely people that took time out of their lives to test my game and pass it. The only sad part for me is that it is $3 and not $1 which is what it was intended to be all along. It was more about accessibility to Scotts wonderful work more than about making money. YES, the Trial is Free to download and play with. A good friend of mines brother passed away a few days ago. His body was discovered after he went hiking in Thousand Oaks california. He had been swept away by the torrential water and drowned. Matt was a great performer and enriched many peoples lives with his music and Antics on the stage. I had the real pleasure of witnessing several of his performances and I was always expecting to see more. Matt shone brightly and that light which has now gone from this world will be sorely missed. This untimley death brings me to melancholy and makes me wonder what is worth doing, and if it is.. Should we try all the more to get it done. Aliens to me are the things that move around a screen, usually by some sort of AI, even if it is a simple AI consisting of velocity direction. These aliens are usually the enemies of the player as well, so their name is appropriate. I have spent a bit of time rewriting the one i had in Pellmell, as the one in Pellmell was very organic. In fact the whole spawning system in Pellmell was truly unique. I do not think i have ever seen a triggering system like it before, in any sort of game, and certainly not a shooter. Shooters tend to be very organized and set in their triggering sequences and amounts etc. Working on Pellmells system recently has made me very proud that i oucld make the living triggering system work and not just blow up in 'certain circumstances'. Anyway, the rewrite is a case of taking what i had and splitting it into three distinct parts. Each with a solid job to be done. This separation will allow me and Paul to more easily construct the Alien waves that we need and also tweak more personal alien data etc. 1. Spawn timing control - This routine works out just When a spawn of an alien should happen. It also knows what kind of spawn, wave #1 vs wave #2 etc. This data usually comes from the spawn data. 2. Alien Initialise - This routine actually sets up an alien in the appropriate place, or places (could be random area etc). 3. Spawn Group Control - This routine will spawn all the extra aliens needed to create the group if once was requested. So by using these 3 routines we can have a nice easy to understand separation of functionality, and also allow us to avoid combination bugs all over the place. tonioght i will finish up these systems and test them more thoroughly. Yes, testing is important at all stages of development. Here we are, having written an Arcade game for a home space. We now want to record the high score table and send it to the other people in your personal space. Seems easy enough when not really knowing anything about Home. Well it is not easy. It appears that the Arcade game cannot communicate with any other object in the scene. what apain in the neck. So if we use a server it will work, but sony are in the middle of changing their protocols and system for that. So we do not want to mess with that currently. so how are we going to do this, Well i do not know at this time, but i have some great minds thiinking of ways to get er done. Like moving objects around in the scene out of eyeshot, and then working out what their positions mean etc :D sounds cool, but the arcade game cannot move objects in the scene. ahh well, we shall see. Aceball has not done well for reviews and it is always nice to get one, however late in the products cycle it might be. This one is fair enough in my mind, and i hope to get more as i find places to send my game codes to for review purposes. Yep, that's right a number of months ago, MS created a system that has 50 codes for each game that a creator gets onto the XBLIG service. I hope to use these in the next few months to get some reviews for all my games. Well i got the first pass on Enemy Bullets today. I think they look pretty sweet. I have always had a fondness for odd shaped bullets, the reason is they look so much more interesting and to me, more intimidating. So i made some that are Egg shaped, or at least oval. Then put them in the game. Of course my first basic bullet type is the trajectory bullet. Initially i used a straight Delta value and then normalized it and multiplied it up to the speed i want for my bullets. But i found that sometimes they go at faster or slower speeds, depending on how close i am to the enemy that fires them. I am not sure exactly why from a math standpoint, but what the hay, i just rewrote the code anyway. This time i wrote it to be a system i have used before and one i know very very well after all these years. I grabbed the target delta and then used a sin/cos combination from the angle to produce a trajectory velocity pair. This works so well and is hugely accurate. Then i got to writing the spinning sprite code, to show off that egg shaped bullet better. Once i got it spinning i had to center it on the sprite, this though was odd, because now the detection was offset, bah! there is always some hurdle to overcome. Anyway with some minor fiddling i set the center up correctly and then moved the sprite to the place it should be drawn from. This fixed the collision and also the rotation. So why make odd shaped bullets? the reason is not just i think it looks more intimidating, but it is one of those little attention to detail items that sets better quality games from cheaper games. It would have ben much faster to make round bullets of course. I recommend that anyone writing games tries hard to put in such details. They can make all the difference when added together. Yup, i am ripping it out. IT being the code and artwork from Pellmell. My aim is to use the Pellmell base code and create anotehr work of art. This time another shooter game, but a completely different style and feel. But i will use the base code from Pellmell, as the menus etc are gonna be similar. the game will however be different and so i need to remove so much stuff. It is hard to fathom just how much stuff we put into Pellmell, it has so many details. all of which need to be deleted. Then the artwork should be removed. Eventually i hope to have a nice clean application to start off with. So wish me luck. Last night Paul and myself worked diligently on the publishers list i had created. I had a list of 17 possible childrens book publishers to go at. Last nigth was the night we were going to wrok through them and come up with a more final list to send off the manuscript, once we are ready. Well we debated that we should just mail a copy to all the publishers on my list, but somehow i argued out of that. The main reason was we needed to check each companies cubmission requirements, which varied a little all over the board. From needing a SASE to not wanting one at all. Anyway it started well enough as we found good possible publishers that did picture books in our age range etc. Then we hit a hard place where some of the these companies want books only as young as 8, or need to be chapter books only etc. This was a bit of a downer, but eventually we ended up with a list we feel good about. 1 publisher wants specialized books, and we have one haha! (not 5GC though). So we are going to be sending out 7 in all hopefully over the weekend, or it will be next tuesday night. I did fill out a submission request form for an agent a week ago, and have just gottena reply. This excites me greatly and also makes me nervous. So we shall see how that pans out. Our favourite publisher from books we liked the look of, and the fact the artwork was charming is called. Shenanigans book publishers. Excellent place. Even if i cannot fins the web address atm, bah! Once Once more into the Breach ? Ok, so that doesn't work. But i have had a really busy night and have managed to get Pellmell ready for Peer review as well. I have been working on version 3 now for about a week. Bringing it's quality up a little more. This game has a little more in it (ok a LOT) than Dreamland, but i sincerely hope it flies through peer review. As it is already published, and my changes were relatively minor. wish me luck. I now have two games in Peer review at the same time :O Though they are separated in the review list by a game call 'Cell Life'. I might have to check that one out. In fact now i have got these games into review. I can start reviewing a few more games myself. Or maybe a few more Playtests. ahh, if only i had more time. Needless to say, i will keep everyone informed. Posted by VoodooChief at 11:47 PM 0 comments Once Once more into the Breach ? A Dreamland Chronicles game has now gone back into Peer Review. Another chance for all those people with Xboxes and an XNA membership to downlad my game and give criticism and Pass or Fail reviews. It is generally a tense time. But i have not put too much technology into this title. That was intentional as i want people to Read the comic and answer trivia. It shouldn't be that hard to play. You shouldn't have to make a decision at the start to what to choose to do etc. So the game also has no title page. Sometimes i feel i must be Schizophrenic. Ignore the above statement as a bold statement written by my other self!! Well the reason for this incongruity has to do with my job, and erm... my job. Maybe that's my hobby. It's hard at times to decide. For my day job I work making games, or usually do. Lately I have been creating a world within a world for PS3 Home. In my home life i have been working on my own companies games for Sorcerygames. I am also hard at work on trying to get my childrens books published. A series f books i believe will help parents connect more with their children when reading together. Along with my home life of a Wife and two lovely children and a cat and rabbit. It seems i am being pulled in ,lots of directions. It is amazing what takes your time and attention when you have responsibilities. Something we all learn as we get older. Usually for all of us the responsibilities get more the older we get. Not that this seems to make it easier to handle them. I truly believe my capacity has gone down, but now i wonder if maybe it hasn't gone down as much as i fear. It has in fact gone down a little, but with so much more to hassle me, it just seems like i cannot do as much! Anyway, i have at least two and sometimes three minds in this Blog. I am sure if you have read any of it, you will see that. It appears i could be living or working 3 separate lives. It is only one life, so we should do what we can with it, it is all very exciting after all, and it is much better to have lived and tried, than lived and not tried at all. Posted by VoodooChief at 10:49 PM 0 comments What am I doing ? The point is that i have decided to do a Revamp of Pellmell. My shooter from mid 2008 that has not done well. Of course i believe it to have not done well because of certain factors. The name for example seems to confuse people, even though it is in the dictionary and describes the frenetic nature of my game quite well. Also the starting letter of P.
What what? i hear you mumble! Well being in the middle of the alphabet might be ok for normal words, but names of games for XBLIg seem to fare quite badly. With only 25 downloads in december the game just has no awareness. Nope, i will not rename it. So why am i revamping it then ? Well it is for a few reasons tbh. And it is the accumulation of these reasons that it is being done. 1. I saw i could make some improvements to the look of the title page. Easy ones, but ones that i feel would make a purchasing person more likely to buy. 2. I want to update the X Marketing screen. This is the page where i put up pictures of my other XBLIG products. The original has 2 games i won't be doing, and now i have a group of games to advertise properly. YAY! 4. I want to have a reason for review sites to review the game. A revamp should do it. 5. A few of the levels are hard, and i wanted to smooth them out a bit. 6. I wanted to make one of the firepowers slightly different. This is now done by adding in the fact it fires forwards AND backwards at the same time! Woot1 get those dirty enemies lurking behind ya! 7. The bloom is too much on the pages with lots of Text, that had to be lowered! I am sure i have other reasons but those are the most essential. So it is nearly ready to go. A bit more testing on the Xbox and a picture added for my next shooter game and it will be ready for submission. When will the Home Space be finished? This is an excellent question and one i have started with this new year. When developing anything and not being paid for it sounds great (does it ?). It also means that at some point everyone will need to be paid. So how to do it..
Well we are hoping (ok ok, expecting) to get a new project in a few weeks, and this will cover the half of the company that is currently working on the Home space. Then we can finish it up and get it out to the PS3. I am quite confident that it will be successful at that time and reimburse our development costs, and maybe just a bit more. It will however put us on the map as excellent technical creators for PS3 home. Now what have i done for 3 days of work eh ? Well i have been organizing everyone to make sure they are working efficiently and also making lists. I check them twice but still miss stuff haha! Sorry lost it there. I have been making lists of what is left to be done to make this a publishable entity. I am surprised to say the list seems quite short, but a few of the items are a bit tricky still. I am hopeful that although i will be moving some of the dev team off this space and onto our paying projects it will still be completed in about 6 weeks time. then its submission time with Sony and hopefully go through about a month later! WOOT! So off i go back to my lists! And along with all my book publishing efforts i am going to start soemthing i am calling 'A Shooter' - an Unoriginal Shooter'. It will be fun, and of course i love shooters! Posted by VoodooChief at 11:10 PM 0 comments When will the Home Space be finished? So my friend Paul and I worked on the cover letter last night. He had luckily made some notes on what should be in the covering letter, and i agreed whole heartedly with his list. This was to be a great start to the letter. Then we went through each key point in order and expanded them, then we shrunk them, then we de-Hyped them. Yeah, most of what we initially came up with for each point would be considered hype. Hype is something we do not want in the letter. For example we put in something like 'Takes the reading interaction to a whiole new level'. This is Hype and so eventaully was replaced with something we consider more factual like 'connects the reader and listener'. This it does, it does not however take them to a new level,.. did they even have an old level haha! This process of disecting the points in the notes and creating them into stand alone sentences was good. Once we had them all done we reorganised the letter to make more sense and flow better. That went quite fast, but then we needed to sort of the fact that two sentences can start the same way now. 'This book' was a popular part of many sentences, and so we edited most all of them out (in fact one still exists). Finally we had a letter that wasn't repetitive in any way and gave out information in a decisive manner. We were finaly happy with our first draft. It only took us about 1.5 hours or maybe a little more. All this for only about a 3rd of a page as well haha! Now we have this first draft we will sit on it for a week and see if we want to alter any of it. Then we will go into the finding of publishers and Agents to send the manuscript and letter off to. As to the question i posed about how hard can it be... Well harder than one would expect is now my answer. Well the adventure books for children i think are going to move along a bit faster now. I have been discussing a bunch of new information i have been reading up on about publishing books. It led me at first to be a bit depressed about my chances of having the book published. However after a couple of days this has turned into real hope. The reason is, from what i have read, we have enough to get published now. The process of going through Peer review was going fine. I did have a few comments asking about a couple of things, which was ok. Noone had failed it however. Well, not till someone did citing that all the pages could be read backwards in the trial version. Well this caused me to remove the game from peer review. Although as it turns out, the commentator was actually wrong. Still it got me to add in a few more features and erm... i will now be able to redo the values for content like maturity rating etc. Even though i feel this game is an E for everyone title, it still has to go under Microsofts rating system, which is a little more wanting of knowledge than the movie or games industry in general. The issue i now face is the 7 days in jail. Yeah, i already added all the features etc.. and so am lost as to what to do with it for the next 6 days. I think i will ponder what else i could add. Ahh well, maybe better luck next time.